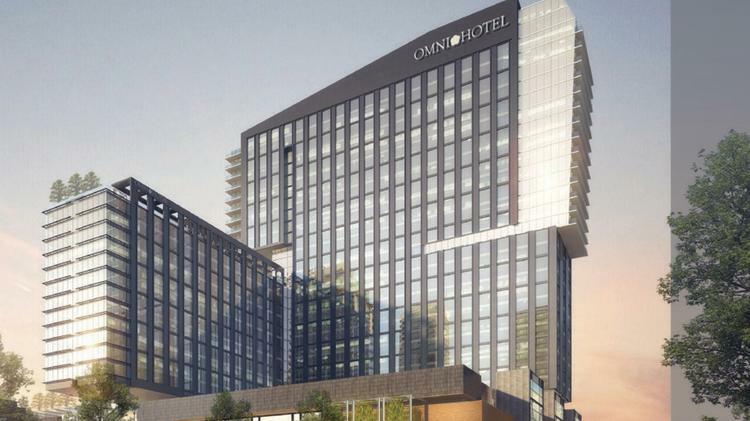 The planned Omni Hotel development in downtown Louisville has grown in scale and will become the city’s third tallest building. The building will be more than 30 stories tall and contain 600 hotel rooms topped by 225 luxury apartments on the old Water Company block. Situated one block from the Kentucky International Convention Center, the new hotel will be a four-diamond, luxury hotel. Only the National City Tower at 40 stories and the 400 W. Market building at 35 stories will be taller than the new Omni Hotel. The complex will include two restaurants, a lobby lounge, 70,000 square-feet of meeting space, a lobby art gallery, a rooftop cafe, spa and fitness center, swimming pool and grocery. The project will be sustainable, with LEED Silver certification. The $289 million project will be completed no later than March 31, 2018. Calhoun Construction Services is proud to assist the Brasfield & Gorrie team (CMR) on this project.